WSRO members are encouraged to submit blog posts. If you have post that you would like to submit to this website, please contact Michael Wandler. New Wheel Options ETC/Employer Toolkit Online! Employee Transportation Coordinators! Check out your available resources in the Wheel Options ETC/Employee toolkit! 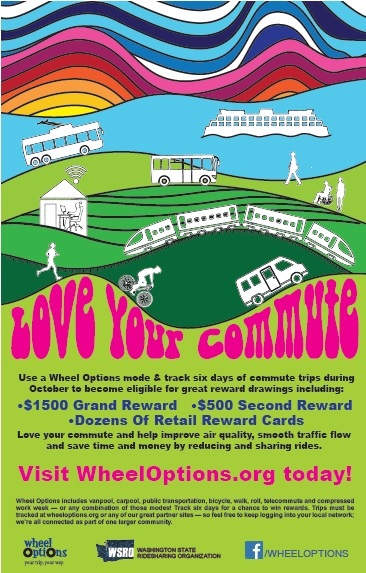 Find everything from Wheel Options Employee Emails and ETC Best Practices to Poster and Banner Graphics to help you promote your commute programs and Wheel Options! October is Wheel Options Month! Folks - it's almost that time of year again! 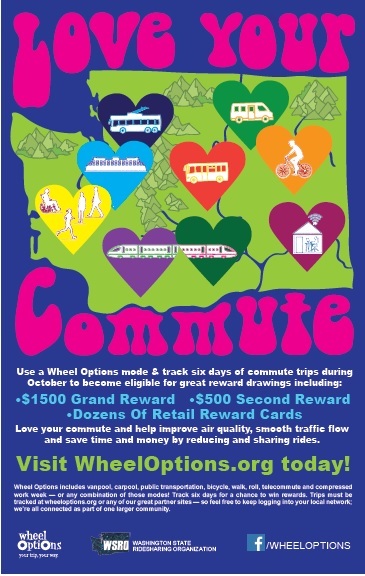 Time to encourage your employees and co-workers to sign up for and participate the annual, WSRO-sponsored, statewide Wheel Options promotion and embark on a new commute! This year's theme is all about the adventure of choosing a new commute and the multitude of money, time and emissions-saving modes commuters can explore in our state - from bicycling, walking, taking transit, vanpooling, carpooling, telecommuting or compressing their work weeks. The contest starts in October…but you may create or check-in on your Wheel Options account today! Did you have a highlight of the conference you'd like to share? A favorite of mine was (Evergreen State College) Scott Morgan's session on 'Thinking Outside the Bike' where he shared his insight into making biking or other active commuting a part of the way you get around everyday - think about making each day, each commute an ADVENTURE. Well, I took what Scott said to heart and rode to the Park & Ride on a bicycle this week for the first time ever. Adventurous? For me, totally. Just getting on a bicycle is a big feat as I am not that comfortable riding around on two wheels. So I commuted twice this week for just a bit over a mile each..so I'm taking baby steps...or is that baby wheels? So how about you? Any conference highlights you want to share? Rocking & Rolling (literally) at the 2015 WSRO Spring Conference! Thanks to all our members, presenters and guests who joined us for the WSRO 2015 Spring Conference in Ocean Shores, WA, this past week. We had two days of learning, networking, innovations, fun and, oh yeah, a bit of shaking as reported tremors rolled their way into Aberdeen and shook some conference guests in session (http://earthquaketrack.com/p/united-states/washington/recent). We had fun evening bowling and taking in the sights during an early morning beach walk as well. We look forward to the next conference and hope you will join us - the exact dates and details are still being ironed out but please keep the WSRO Fall Conference in mind - we are vying for Lake Chelan in October. Happy National Bike Month, everyone! One of the scholarship recipients to our spring conference recently shared some of her thoughts on her experience with us, and we thought we'd pass them along to the rest of our members. Enjoy! I’m so grateful for the scholarship I received that allowed me to attend the Spring WSRO Conference. I’m fairly new to the area of transportation management, so attending the WSRO Conference was a great opportunity for me to learn and meet other professionals in the field. At the conference I was inspired by Helen Thayer’s talk about her experience conquering the 364 mile journey to the Magnetic North Pole, I gathered program management ideas through sessions on Bike Sharing and the “Go Bronzeville” program, and I heard directly from state leaders’ Lynn Peterson and Brian Lagerberg about the current and future transportation plans for the State of Washington. Outside of the sessions, I had an opportunity to meet other professionals to share program ideas and experiences. These connections are priceless. Thank you for giving me this opportunity. I look forward to future conferences and involvement in WSRO. Please take a moment to select your preferred Membership Structure. The Board is asking to update the structure of our current membership dues to improve administrative processing. Please complete your selection of Option 1 or Option 2by clicking on this link:https://www.surveymonkey.com/s/WSRODues. Please submit your vote by end of day, Wednesday, December 11, 2013. The new fee structure will go into place in January 2014. Please take a moment to complete the ballot to elect the incoming WSRO Board of Directors. We will be electing two new directors with this election. Members in good standing may vote for directors. The Voter Pamphlet outlines each candidate qualifications. Please complete the ballot and return to debbie.anderson@commtrans.org or fax to 425-438-6136 by end of day, Wednesday, December 11, 2013. Would your company or organization be willing to make charitable donations on behalf of employees who walk, bicycle, carpool, vanpool or ride the bus to work, instead of driving alone? One of our WSRO members, Mary Anderson with the Whatcom Council of Governments, is currently in graduate school at the University of Washington studying Sustainable Transportation and preparing a capstone project to examine whether donations to the charity of one’s choice are more motivating than receiving financial incentives to not drive alone to work. If you are interested in participating or would like more information, please contact Mary Anderson at 360-676-6974 or mary@everybodyBIKE.com. Companies and organizations of all sizes are encouraged to participate.